Atton: We've hit the ground. This is Korriban. Why would one of the Jedi you're looking for come here? Visas: It seems quiet - just the wind... but deep beneath the surface, you can feel the pain of what took place here. There is great power in this place - for those who can hear its call. Kreia: There is much that would draw a Jedi to this place. The resting grounds of the ancient... and more recently departed Sith... contain many teachings believed lost. The most likely place to find our lost Jedi is the ruins of the old Academy. Kreia: After Malak and his army were defeated, instead of restoring order to Korriban, Revan suddenly departed, leaving both his destination and reasons for leaving a mystery. Kreia: After Malak and his army were defeated, instead of restoring order to Korriban, Revan suddenly departed, leaving both her destination and reasons for leaving a mystery. Kreia: It was said that Revan intended to return to Korriban to subdue any potential Sith insurgents. But Revan disappeared. Kreia: It took a year or two for the Republic to send a force here to deal with any Sith that may have remained. They found Korriban much as we have - barren and lifeless. It was assumed that the remnants of the Sith turned on each other, vying for what little power remained. 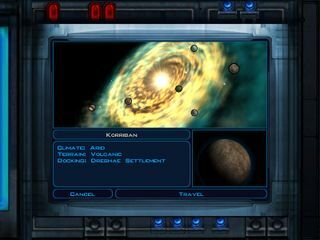 The Republic found evidence that several Sith Lords escaped Korriban, fleeing to remote sections of the galaxy. 2. Do you think there are any living Sith here? Kreia: As lifeless as it seems the dark side is very strong here. The Sith Lords would not ignore such a powerful place. There is much that can be learned, even here. 3. Let's head out, then. Kreia: If you walk Korriban's surface, you shall walk it without me. 1. Why won't you come with me? Kreia: I cannot. This place is strong with the dark side... it is difficult to center myself here. Korriban holds few secrets from me... but much that you should learn. 1. Korriban doesn't look that bad. I'm not afraid. Kreia: Perhaps not. But I would caution you to guard your feelings carefully here - Korriban attacks the spirit and the body, and there have been few who can fight its power. 2. Very well. Stay here and keep the engines primed in case we need to leave quickly. 3. Fine. I didn't want your company anyway. Kreia: I will remain here and meditate. Our link remains, I shall contact you and provide guidance when needed. The Academy is on the other side of this valley. Be careful. Dark energy fills these ruins... and even the fallen Sith live still. You are searching for traces of the lost Jedi in the ruins of Korriban. Kreia suggested looking within the Sith Academy. This page was last edited on 6 October 2018, at 00:03.